Crete is divided into four prefectures (nomos). From west to east they are: Chania, Rethimnon, Iraklion and Lassithi. Each one of the prefectures is subdivided into provinces (eparchies). The Nomos Chanion is subdivided into Kydonia, Apokoronas, Sfakia, Kissamos and Selino. The Nomos Rethimnou is subdivided into Rethimnon, Milopotamos, Amari and Agios Vasilios. The Nomos Irakliou is subdivided into Malevizi, Temenos, Pediada, Pirgiotisa, Kainourio, Monofatsi and Vianos. 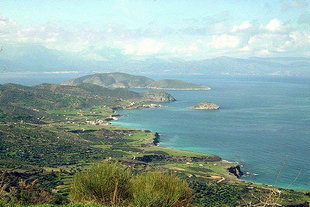 The Nomos Lassithiou is subdivided into Mirabelo, Lassithi, Ierapetra and Sitia.